Little black satin dress with white collar and cravat bow. 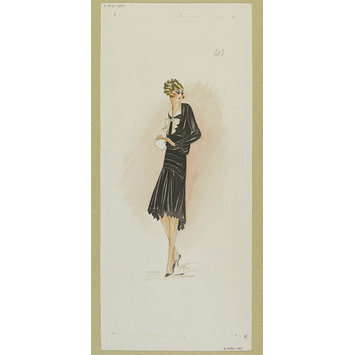 One of 104 dress designs for Summer 1929 bound in volume. Paquin (Madeleine Wallis). Little black satin dress with white collar and cravat bow. One of 104 designs for Summer 1929 bound in volume.